I just discovered this “so terrible she managed to land a brief moment in the spotlight” performer thanks to Alan Cross. 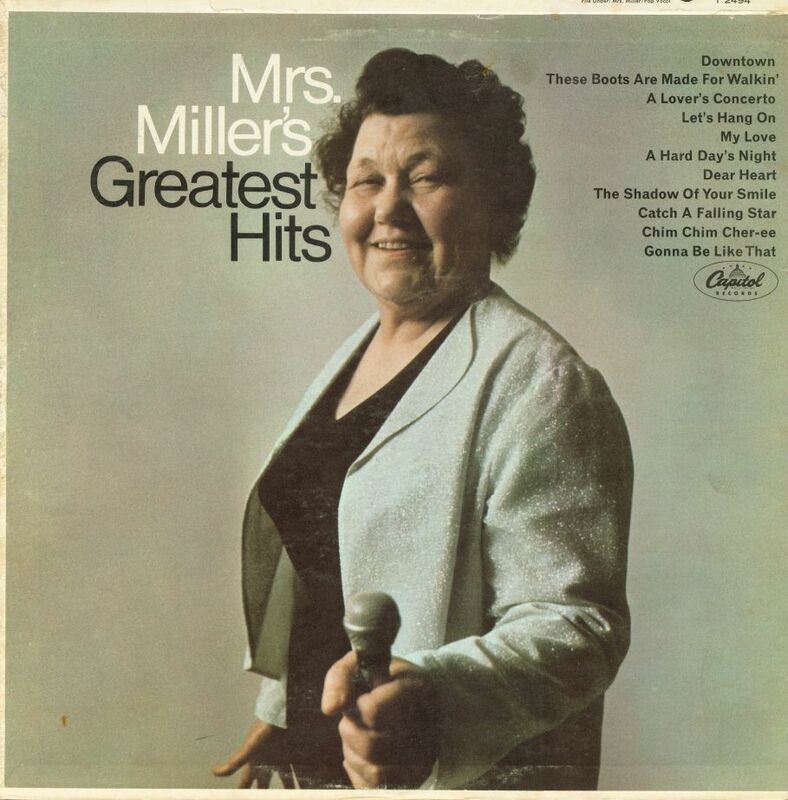 This is Mrs. Miller and she is, as Cross points out, the Florence Foster Jenkins of the 1960s. Elva Ruby Connes Miller “gained some fame in the 1960s for her series of shrill and off-key renditions of then-popular songs such as ‘Moon River,’ ‘Monday, Monday’ ‘A Lover’s Concerto’ and ‘Downtown.” That’s what Wikipedia says. It also describes her singing “in an untrained, Mermanesque, vibrato-laden style,” which is hilarious and sounds like it came from someone studying hard to be a very serious music critic, so thanks to whoever came up with it. Her rendition of “Downtown” hit No. 82 on the Billboard Hot 100 singles chart in 1966. It is seriously unlistenable. Interest dropped off shortly thereafter and she retired from music and spent the rest of her days doing charity work. I wonder what force drives these people to stardom every few decades or so. Is it their sheer chutzpa? The joy they get out of doing something that they should, by regular rules, not be doing? A mean-spirited chuckle at their expense? All three? I’d like to think I never indulge in that last one myself. I meditate and stuff. Then, of course, there was American Idol castoff William Hung, who made a brief career out of butchering Ricky Martin’s “She Bangs” with the infectious enthusiasm of a toddler dancing for a roomful of grandmas. But if his appeal is his childish guilelessness, elevating him to celebrity status seems a little condescending. Do we enjoy these people because they’re kind of morons, maybe possibly a little mentally off? Because I’m uncomfortable with that. Just sayin’. But who cares what I think?